The Centers for Disease Control and Prevention is urging people to take steps to prevent West Nile virus infections. Outbreaks of West Nile virus disease occur each summer in the United States. This year, some areas of the country are experiencing earlier and greater activity. Three hundred thirty-four human West Nile virus infections have been reported to CDC ArboNET from Alabama, Arizona, Arkansas, California, Florida, Georgia, Illinois, Iowa, Kansas, Kentucky, Louisiana, Maryland, Michigan, Minnesota, Mississippi, Missouri, Nebraska, New Jersey, New York, North Dakota, Ohio, Oklahoma, South Dakota and Texas. Thus far in 2012, 42 states have reported West Nile virus infections in people, birds, or mosquitoes. A total of 241 cases of West Nile virus disease, including four deaths, have been reported to CDC. This is the highest number of cases reported through the end of July since 2004. Almost 80 percent of the cases have been reported from three states, Texas, Mississippi, and Oklahoma. West Nile virus is transmitted to people by infected mosquitoes. In the United States, most people are infected from June through September, and the number of these infections usually peaks in mid-August. Seasonal outbreaks often occur in local areas that can vary from year to year. Many factors impact when and where outbreaks occur, such as weather, numbers of mosquitoes that spread the virus, and human behavior. Install or repair screens on windows and doors. Use air conditioning, if you have it. Empty standing water from items outside your home such as flowerpots, buckets, and kiddie pools. Approximately 1 in 5 people who are infected with West Nile virus will develop symptoms such as fever, headache, body aches, joint pains, vomiting, diarrhea, or rash. Less than 1 percent will develop a serious neurologic illness such as encephalitis or meningitis (inflammation of the brain or surrounding tissues). 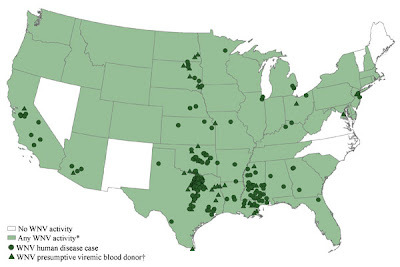 About 10 percent of people who develop neurologic infection due to West Nile virus will die. People over 50 years of age and those with certain medical conditions, such as cancer, diabetes, hypertension, kidney disease, and organ transplants, are at greater risk for serious illness. There are no medications to treat, or vaccines to prevent, West Nile virus infection. People with milder illnesses typically recover on their own, although symptoms may last for several weeks. In more severe cases, patients often need to be hospitalized to receive supportive treatment, such as intravenous fluids, pain medication, and nursing care. Anyone who has symptoms that cause concern should contact a health care provider.